WarpRider – I have no recollection of Lost Horizon, yet their band name seems so familiar. For all intents and purposes this is the first listen for me; we’ll go with that. I do like a good power metal band whether it’s loaded with cheese or not, but it has to be rhythmic and entertaining; not sappy and boring. 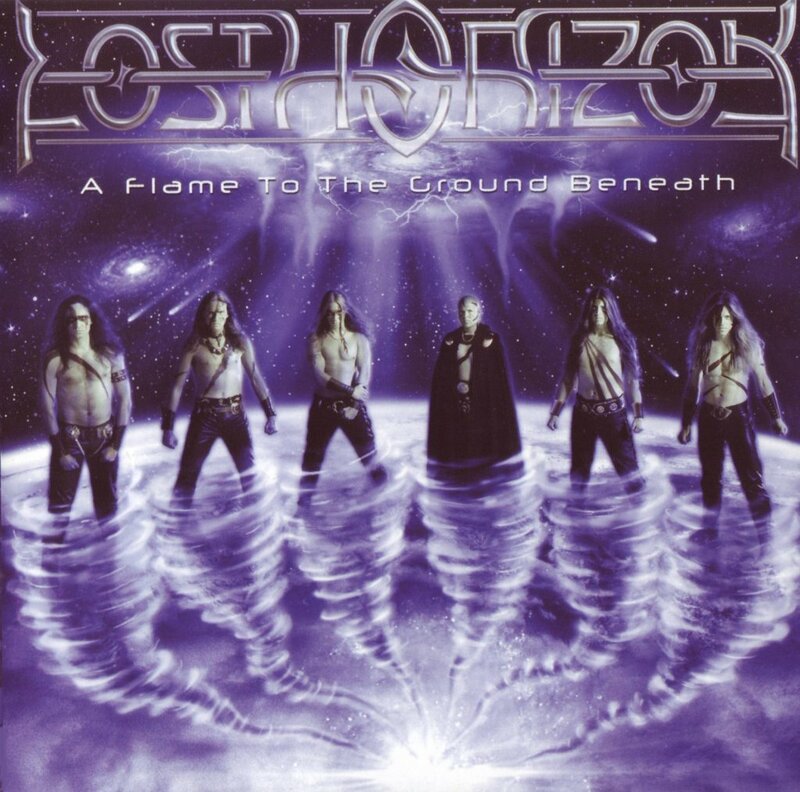 Lost Horizon is certainly not the latter; they employ a lot of guitar solos which always pleases me. The excessive double bass drumming gives the songs a nice cadence. Overall, it’s one of those bands/albums I wonder how I missed, but since it was released in 2003 I know where I was in the world at that time and it’s no surprise I missed it. It was a slow time in metal for me. Irmelinis – Here’s my nostalgia-trip. “A Flame To The Ground Beneath” was released 11 years ago, during a time when power metal was very big in Europe, as well as in my home. Hammerfall, Edguy, Morifade, Helloween, Sonata Arctica, Luca Turilli, Stratovarius, Avantasia, Lost Horizon… This was the type of music that transformed me into a metal lover in the early 00’s. So when a good friend of mine said that he’d like to see Lost Horizon get re(tro)viewed by us, I liked the idea. They may never have been a huge international success, plus they only released two albums, but I remember hearing quite a lot of positive words about them here in Sweden in my newbie metal years. No wonder, many metal fans thoroughly enjoyed them back then, and I still think their style of never-too-cheesy power metal holds up really well. Mainly because of the singer’s incredibly strong, majestic voice combined with a very talented, inspired songwriter; what a great team they make! This second full length is not as speedy and aggressive as their first one, here the slightly symphonic and somewhat proggy melodic sound, together with the deep lyrics, make the songs feel more adventurous and harmonious. So much so that I have to dust off my old power metal air guitar and go for a happy play-along during all the fun guitar solos this band provides. I’m glad I was reminded of this (almost forgotten) little gem. ChristopherMammal – I don’t know if I know Lost Horizon. I might have heard them years ago but they didn’t leave an impression. There is nothing wrong with their music. It has all the correct ingredients for power metal – thumping bass, heavy metal-style guitars, high-speed drumming, talkative keyboards and a clean, high, powerful tenor voice. But so does almost every other power metal band. It’s not a genre that seems to have developed in many new directions. Posted on May 26, 2014, in Album Reviews, Retrospectives and tagged Lost Horizon, Power Metal, Retro Review. Bookmark the permalink. 1 Comment. All that 90s and 00s Power Metal is mostly not my music – from Stratovarius to Sabaton. Lots of cliches, Keyboard jingling, no innovativeness and most important no Power at all. Power Metal is for me 80s and early 90s. On the other hand, when I started listening to Metal it was Gamma Rays “No World Order” and Blind Guardian’s “A Night at the Opera” and Grave Diggers “Tunes of War”. Blind Guardian stood the test of time – never being a typical Power Metal band anyway – Grave Digger and Gamma Ray lost quite a bit of appreciation but are still liked, and if it’s due to nostalgia. Anyway I guess for their kind of genre Lost Horizon were doing well.